The strange flying worms known as skarm are dangerous predators that patrol the skies beyond the magic curtain of Een. Skarm have long tails, spiny wings and sharp tongues that zip in and out of fang-encrusted mouths. Perhaps the most prominent feature about a skarm is that it has a single round eye that seems to take up most of its head. Skarm are green with brown blotches and have only two tiny legs with hooked claws. They are known for their loud ear-piercing shrieks. They live in scattered forests and meadows, and are nocturnal by nature. Their diet consists of a wide variety of creatures, for they seem to eat anything that moves—including Eens. Juniper Jinx once battled a skarm while on her quest with Kendra Kandlestar to find the Box of Whispers. Jinx fought valiantly against the giant worm, but it captured her and carried her to the Crags of Dredge. 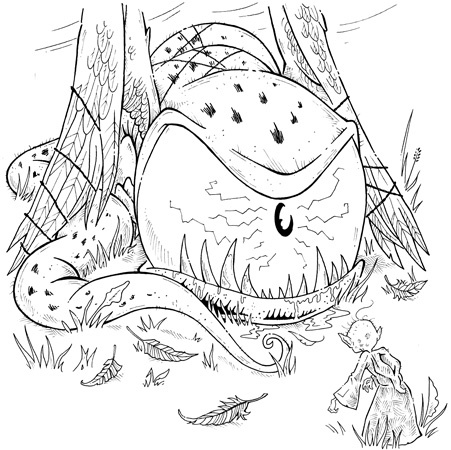 The skarm intended to feed Jinx to its nestlings, but Jinx ensnared the skarm with a piece of rope, and rode the worm-like creature back to her friends. The mysterious and sinister Een known as Agent Lurk had a way with skarm. He managed to tame them enough to be able to ride them.